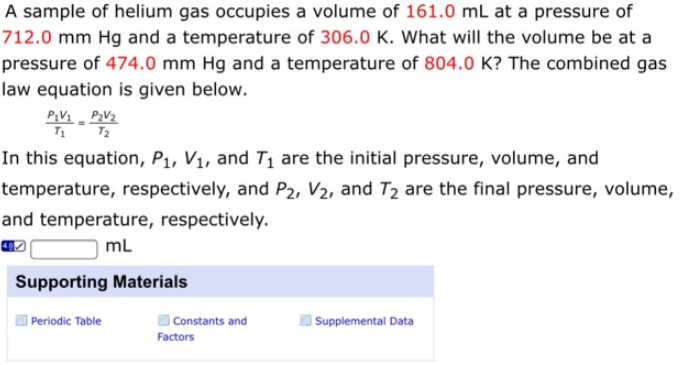 Solution: A sample of helium gas occupies a volume of 161.0 mL at a pressure of 712.0 mm Hg and a temperature of 306.0 K. What will the volume be at a pressure of 474.0 mm Hg and a temperature of 804.0 K? The combined gas law equation is given below. P1V1/T1 = P2V2/T2 In this equation, P1, V1, and T1 are the initial pressure, volume, and temperature, respectively, and P2, V2, and T2 are the final pressure, volume, and temperature, respectively. A sample of helium gas occupies a volume of 161.0 mL at a pressure of 712.0 mm Hg and a temperature of 306.0 K. What will the volume be at a pressure of 474.0 mm Hg and a temperature of 804.0 K? The combined gas law equation is given below. In this equation, P1, V1, and T1 are the initial pressure, volume, and temperature, respectively, and P2, V2, and T2 are the final pressure, volume, and temperature, respectively.